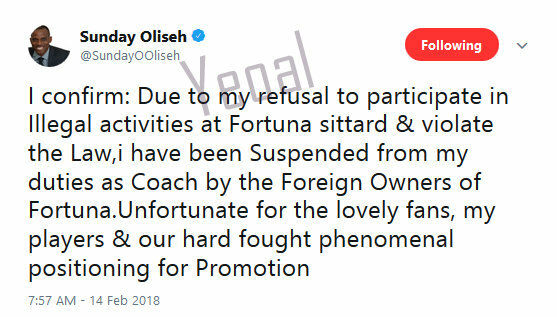 Former Super Eagles coach, Sunday Oliseh has been suspended by Dutch football club, Fortuna. While he did not give the exact reason for his suspension, he hinted that he was suspended because he refused to participate in illegal activities. Now, rumour has it that the " illegal activity" he is talking about is match fixing. Not sure how true this is, but that is the gist that is going round. While with he was actively with the club, he made history with them here.